Long before augmented reality was a widely understood term, it seemed that everyone with an interest in consumer tech couldn’t wait to get their hands on a pair of the glasses, which promised to help facilitate navigation, communication and entertainment for users on the go. Beta testers, known as “Explorers,” were the first to try out Google Glass. Unfortunately, it didn’t go so well. Users earned the nickname “Glassholes,” and the nerdy aesthetic of the glasses made it so few people were particularly enthusiastic about wearing them in public. One moral of the story is this: Design matters. A lot. Right now, most autonomous vehicles feature hulking sensor suites on their roofs. Developers are more focused on making sure the sensors and other technology actually work than with aesthetics. That is fine in the early stages of the development process. But at a certain point in the not too distant future, the look of an autonomous vehicle is going to play an increasingly important role in customers’ decisions. 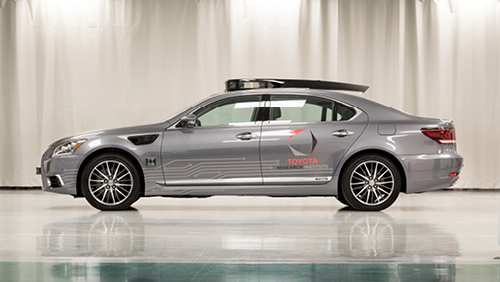 The latest driverless prototype from the Toyota Research Institute (TRI) embraces this idea. At CES, Toyota unveiled a sleek Platform 3.0 autonomous concept vehicle that looks markedly different from other self-driving cars. Built on the body of a Lexus LS 600hL, Platform 3.0 is founded upon three core principles: Industry-leading performance, a design that can be reproduced at scale and a distinct, sleek design that consumers want to be seen in. To combat driverless cars’ reputation for unsightly rooftop sensor suites that make even the clunkiest roof rack look aesthetically pleasing, TRI worked with designers at Toyota design studio CALTY Design Research to develop a more visually appealing design alternative. They dubbed their philosophy “intelligent minimalism,” using available sunroof space to lower the overall height of the car’s embedded sensor systems. Platform 3.0 is more than just a design exercise. The concept car boasts performance benchmarks like 360-degree perception that extends 200 meters, and Lidar design and positioning that makes it easier for the vehicle to detect dark objects, small objects and low-level objects. While plenty of autonomous driving concepts were paraded around at CES this year, few were as pretty as TRI’s Platform 3.0. As engineers continue to work to improve the system, the concept is set to soon have brains that match its impressive beauty.